Why Should Schools Invest in Software? 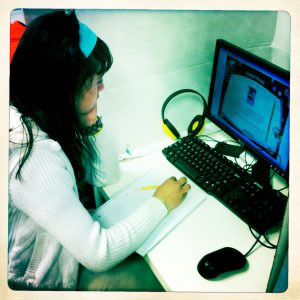 A Rocketship student works at the Learning Lab using adaptive software. The question keeps coming up: What technology should schools invest their money, time, and effort in? During this fraught time in our economy, the decision to invest in tools like adaptive software and other tech devices is sometimes portrayed as excessive or wasteful. In Sunday's New York Times, Matt Richtel and Trip Gabriel wrote about software program companies inflating their effectiveness in schools, and how they "ignore well-regarded independent studies that test their products’ effectiveness." In the next couple of days, we'll deconstruct the writers' sources of information -- namely the main source for their claim that the technologies are ineffective, the What Works Clearinghouse. "It shouldn't be a call to stop for investment, but a call to invest more, because we need to get it right." In the meantime, I spoke to Aylon Samouha, Chief Schools Officer at Rocketship Education, a network of charter schools in the Bay Area that uses software to reinforce basic skills mastery. (You can read more about their hybrid learning program and their competitive scores in this MindShift series). Samouha is in charge of the design and strategy of Rocketship's hybrid learning model, as well as its teacher and principal training program, among many other things. Samouha, who lives and breathes educational software and is consumed with finding the best way to integrate technology into the school day, has a very different perspective than what Richtel and Gabriel portray. First, the facts. In an independent study released in August by SRI International, which conducted a randomized controlled trial using DreamBox Learning, those who used the program for 16 weeks scored 2.3 points higher on the Northwest Evaluation Association math test than those who didn't -- the equivalent to progressing 5.5 points in percentile ranking (for example, from 50 percent to 55.5 percent). It's important to note here that not all assessments are created equal, but Samouha believes that the NWEA is an adaptive diagnostic test and a dependable measure because "millions of kids taken it," he said. Those students' gains are not only statistically significant, he said, but the fact that they were achieved in such a short time -- 16 weeks -- indicates that using the program for an entire school year would show even greater gains. But Samouha is not a tech evangelist just for the sake of using tech. "It’s true that there’s a lot of time wasted on computers right now. There are wrong ways of doing this. But it’s so clear that we have to figure out how to educate students in the 21st century in ways that go beyond the traditional classroom model, which was created in the 17th century in Prussia. The fact that it needs to change is not a question in my mind." So how to make this happen? "The more we integrate software with what’s happening in the classroom, the better results we’ll see. That will take work and investment. Schools will have to invest time, content providers will need to invest time and energy into make it more plug-and-play and make it more integrated into the school day." But Samouha says the Times article proves the opposite of what the writers end up conveying. "It shouldn't be a call to stop for investment, but a call to invest more, because we need to get it right," he said. Aligned to common standards, "so we're all speaking the same language." Data needs to be seamlessly integrated and programs need to be able to talk teach other so teachers can easily make sense of the data. Rather than be standalone in their environment, they need to be part of the open Web, so they can be linked to each other. "Right now there are a lot of walls between programs, just like before Steve Jobs agreed to use Microsoft, so people using Macs couldn't open Microsoft programs," he said. "Those walls exist now, if you’re trying to quilt together a number of interventions to put the right thing in front of a child at the right time, it makes it much harder when those walls exist. That’s what Samouha is working towards. But it won't magically happen. It takes investment from schools, from vendors, from educators. "But we can't just abandon ship and go back to the traditional school model." At the heart of this discussion for the general public and most major media is the question "why." Why should we bother to invest in all this when we (adults) all turned out just fine with the way we were schooled? Why can't just teachers keep teaching the way they have been? Samouha believes that's a false dichotomy. He's not arguing that teachers should be replaced by software, but that students will benefit from an array of different learning methods. Software will help them practice drills and basic skills, but teachers will be always be the most important part of the equation. "People are arguing that it's either human beings teaching kids or computers," he said. "But that’s not our answer for anything else. When I want to communicate with my wife, I talk to her in person, I use my cell phone, I e-mail and text, that’s the way of the world. But for some reason, education is exceptionally not like that." I also spoke with Samouha about the difference in quality between math and literacy software, and I'll report back on that in the coming days.